Ensto is introducing its world-first combined electric vehicle charging station and commercial advertising screen to the UK, to give businesses the option of funding their annual running costs through advertising. Ensto’s Chago Media is described as an innovative approach to EV charging, combining outdoor advertisement media, with an option of one or two charging points incorporated into the station. 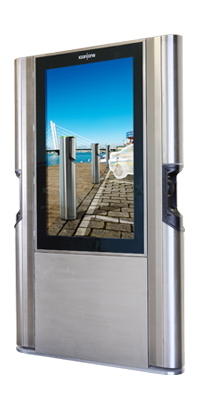 Chago Media’s robust steel structure contains a 55” LCD display suitable for use in all weather conditions, it’s remotely controlled through a cloud-based media content management system and is available with one or two fast charging Type2 sockets (max 22kW per socket). We understand that Chago Media has already been successfully launched in a number of European cities including Oslo, Helsinki, Vantaa, Turku and Kerava. James O’Neill, Ensto UK director told us “The smart design of Chago Media incorporates digital advertising to cover off the costs of maintaining a charging infrastructure for a company, retailer car park owner or local authority”, comments “Customers need to simply select the charger that delivers the required end-user services while fulfilling their technical requirements. It’s the ideal solution for businesses looking to expand their customer offering as the popularity of electric and plug-in hybrid vehicles continues to grow within the UK. Having access to on-site charging increases a business’s desirability for EV customers”. Ensto UK is currently liaising with several outdoor advertising specialists, to utilise their expertise to ensure customers are able to achieve the most out of their investment in a Chago Media charger. This entry was posted on Wednesday, April 5th, 2017 at 19:23 @849 and is filed under DailyDOOH Update. You can follow any responses to this entry through the RSS 2.0 feed. You can leave a response, or trackback from your own site.